During the commemoration of Yolanda’s (Haiyan) first anniversary last November 8, 2014, former Mayor Alfred Romualdez, Bongbong Marcos’ cousin urged the Aquino administration to build back Tacloban for them. He lamented that the priority was not building back their lives. The previous government was always after the economy and they don’t get a good share of that. Recently, Marcos himself inspects the place and other parts of Leyte that needed rehabilitation. He is happy to announce that the credit for building better is due to the current President Du30. 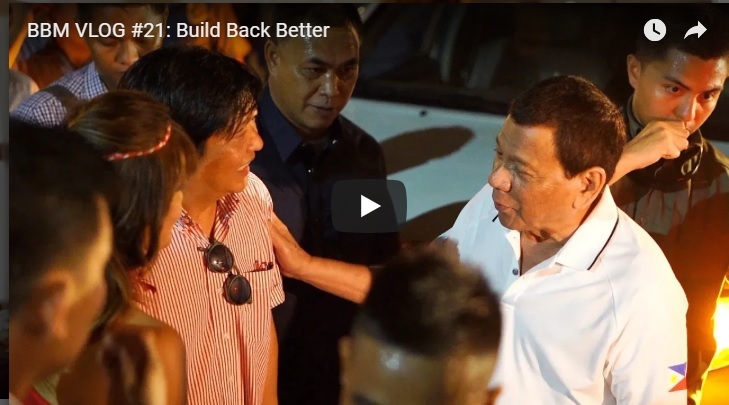 [VIDEO]: Build Back Better: Anumang pagsubok ang magdaan, ang Pilipino ay magsusumikap upang makabangon at mapabuti ang kalagayan. Egalitarian is relating to or believing in the principle that all people are equal and deserve equal rights and opportunities. It cannot be denied that there’s a big gap between the rich and the poor in the country today. The masses certainly do not have the same access to quality training, networking, credit or investment facilities than those who can afford them. “In my father’s administration, I kept hearing ‘nation-building’, and I do not hear that phrase anymore,” he said. “It’s more politicking than nation-building,” Marcos added. He was also quick to dismiss corruption allegations against his family, saying: “None of the cases that were filed against us have been won.” Despite the accusations, he suffers on behalf of his father, he remains forgiving and still aims for unity among Filipinos. The younger Marcos is believed to lead the nation at one point. This is the prediction of unbiased political analysts, astrologers, and fortune tellers. Uncertainties might loom in his VP electoral protest against Vice President Leni Robredo for cheating during the 2016 election. However, this also serves as a good way of promoting his presidential bid may it be for 2019 or 2022. Regardless, the credit still goes to the good President Du30 who believes in the Marcoses.